Welcome to the 21st-century church culture experience. The era of copywriters, designers, project managers, social media strategists and Executive assistants in the Church organisational structure with the singular aim of providing a seamless and orderly system. Our experiences have become immensely influenced by these aesthetics, by our modes of worship and the influence of technology in general (which to be clear, is not really a bad thing. Well, until it is). And it’s in the midst of all these that “Church Unusual” became such a thing. 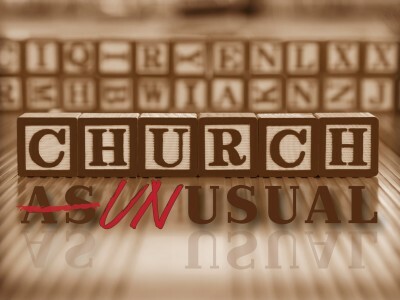 Particularly used by New Age Pentecostals, Church Unusual is the catchphrase now used to emphasise the point that the experience at a place of fellowship or an upcoming event is too good to be believed it happened in a church setting. Okay, maybe that definition was slightly biased to drive home the point early in the essay. There was such a time when people defined the church experience as boring, not because that was how it was designed to be or how it was at the beginning but because of the doctrinal extremism and orthodoxical beliefs of most people within the Christian circle. It was the period of time when everything you could ever think of was labelled a sin – owning a Television set, wearing trousers/earrings as a lady, using sophisticated musical instruments in the church, etc. Then, new age churches sprang up with a certain kind of belief, slightly antithetical to the beliefs of the orthodox, evangelical and protestant conviction. However, it wasn’t a new experience. It was heavily founded on the original foundation of the Christian Church in the biblical book of Acts – on freedom, liberalism, radical faith, engaging culture and experiencing joy. One that didn’t depend on how we presented ourselves but in whom we believed. The problem, however, came when we needed to convince people who had given up on the church experience because they felt it was very strict that the new age pentecostalism was one they would enjoy, one that had no restrictions and taught on total freedom in Christ. And then, the birth of Church Unusual. But, what exactly is the church and how did it come into place? “Go ye into all the world, and preach the gospel to every creature” is one of the last commands Jesus gave his disciples, yet one of the most powerful. One that has been the foundation of the birth of the church (as a body and as a system). Weeks after that command, the church fully began operation, the disciples were first called Christians and from the works of 11 disciples, the gospel has spread and still spreads rapidly all over the world. Thousands of years after the initial birth of the church, we have Church Unusual and rather than question it, it has become a huge part of our publicity for events in the pentecostal church. Some churches have been named after it, hundreds (if not thousands) of events designed to attract youth and involving dancing, feasting and singing have been themed after it and it’s just generally that thing we say when we want our church to sound cool hence, “Welcome to Church Unusual”, “My Church is Church Unusual” etc. Unusual – not habitually or commonly occurring or done. Remarkable or interesting because different from or better than others. So, when we say a church is “Church unusual”, we are indirectly saying that the experiences of that church are either different from others or it is a shift from the original design. Whilst, the intent behind that might be pure, the idea itself is faulty and has led us, many times into unfavourable situations. The Church has always been and will not become unusual because of the advent of technology. We might change our means of broadcasting the message, we might create social media platforms to reach out to more people, we might invest more in our brand and communications team to help drive conversations on the internet but the core of our message remains the same – Christ. There is nothing unusual about whatever the church needs to engage in. The practices of the early church still consist of the very things we claim as part of the new age church – freedom, liberalism, radical faith, engaging culture and experiencing joy. It’s normal to want to sound different, better, superior or “cooler” and more inclusive. But that has never been the mission of the church and never will be as we have been called to the unity of faith – to one authority, one God, one faith, one body. And if, in the bid to be different, we go off this path, then indeed, we have missed the point and we risk falling into the same error of extremism that we planned to correct.